Capable of battling bend fatigue and bringing lots of other benefits to the table, our 6×36 construction compacted rope is a great investment for a variety of uses. Whatever length of rope you require or fittings you want to add, we can create the perfect 16mm 6×36 compacted wire rope for you. This 16mm diameter rope has undergone a compaction process to tightly compress the strands. This not only makes it smaller, but also stronger. In comparison to a standard non-compacted rope of the same diameter, the compacted version can lift more weight. 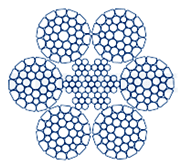 Meanwhile in the middle the 6×36 configuration of outer strands is wrapped and compacted around a core made of steel, enhancing the reliability. This product will be able to tackle load-handling tasks of many sorts. They are perfect for use over pulleys and sheave blocks due to their smaller diameters and smoother exterior. They are commonly used as crane ropes. It is also more attractive than standard galvanized rope, with the compacted strands creating less friction and therefore easier to handle, which may be relevant in some cases. Give Rope Services Direct a ring on 01384 78004 if you want guidance when it comes to choosing rope products. From general tips on wire rope choice and fitting options, to quotes and order handling, you can also contact our team via email if you wish. 16mm 6x36 Compacted Wire Rope Overall rating: 5 out of 5 based on 6 reviews.